Olivia Cleans Green: Brooklyn Swaps! Ready to let go of objects you don't need but not sure where or how to responsibly dispose of them? Want new stuff but don't want to contribute to industrial waste? 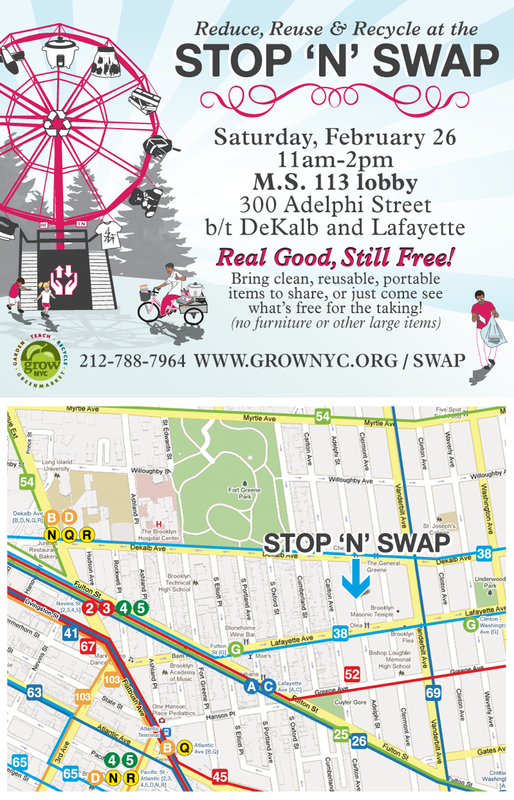 Share and/or collect things that are in good condition with your neighbors at one or both of the upcoming Brooklyn community swaps listed below. Busy parents should check out the ongoing online swap service listed below. Stop 'N' Swap - Brooklyn from GrowNYC on Vimeo. Looking for a good reason to clean out your closet? How about sharing your stuff with your neighbors! Please bring clothes, shoes, jewelry, handbags, and other accessories that are in good condition to LaunchPad. Be prepared to find *new to you* stuff you will love too! This is a free event and welcome to all. (You don't have to bring anything to share besides a smile!) Please remember to think green and bring your own bag. You are also encouraged to bring snacks to share too. Please make sure everything is freshly washed or dry cleaned to make sure only love is shared, not bed bugs. Watch a NBC news video about how it works. I stopped n swapped then I met a son of a farmer.